Jarrad survived the impact and made a full physical recovery. But he sustained a frontal lobe injury to his brain. This area governs concentration, memory, forward planning and personality and the damage has left Jarrad socially maladjusted, very hard to live with and a danger to himself and others. “Jarrad looks like any other 19 year old man but his brain doesn’t fully function. He has no insight which means he lacks inhibition, social manners or awareness of other people’s feelings. He has no memory and cannot concentrate for more than a minute or two. This means he can’t work or live an independent life,” says Sarah. After seven years with Jarrad at home, Sarah could no longer cope. 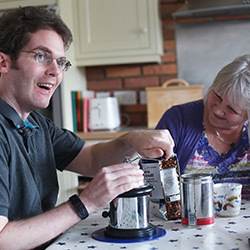 With the compensation Jarrad received with the help of his Brain Injury Group solicitor, asb Aspire LLP, they can afford for him to live at a home for brain injured men.